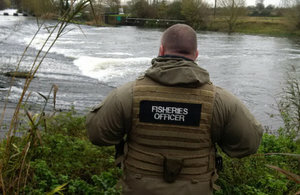 Staffordshire, Warwickshire and West Midlands anglers caught cheating fellow anglers during the bank holiday weekend. Environment Agency enforcement officers were out in force over the May Day bank holiday weekend in a bid to catch the few anglers who fish without a rod licence. Every year, nearly 1 million anglers fish legally, respecting each other and the sport. The money they pay to buy a licence supports fish, fisheries and fishing, and protects the future of the sport. A small number of anglers refuse to buy a licence, cheating the sport and their fellow anglers. Over the 3 day weekend enforcement officers saw 396 anglers fishing legally at 29 locations across Staffordshire Warwickshire and West Midlands. Officers used their local knowledge to catch offenders and in total 23 were reported for fishing without a valid licence. Over the bank holiday weekend across England, Environment Agency enforcement officers checked 3,127 licences and reported 237 for fishing illegally. Overall last year, Staffordshire, Warwickshire and West Midlands enforcement officers checked 5,584 licences and reported 265 for fishing illegally. Last year, in England the Environment Agency checked over 62,000 rod licences and prosecuted more than 1,900 anglers for rod and line offences resulting in fines and costs in excess of £500,000. We are passionate about making the sport of angling the best it can be and we take our job of protecting angling, fisheries and the environment very seriously. The vast majority of anglers who fish legally deserve to see those who flout the law brought to account. To that criminal minority our message is clear; we won’t hesitate to take action to stop illegal fishing. Nearly 1 million anglers have a rod licence and legally enjoy the sport of fishing; we’re urging everyone to get their licence online before they next go fishing. Money from rod licence sales is invested in England’s fisheries and is used to fund a wide range of projects to improve facilities for anglers including; protecting stocks from illegal fishing, pollution and disease, restoring fish stocks through restocking, eradicate invasive species, and fish habitat improvements. Rod licence money is also used to fund the Angling Trust to provide information about fishing and to encourage participation in the sport. To help crack down on unlicenced fishing the Environment Agency urges anyone to report illegal activity by calling the Environment Agency Incident Hotline on 0800 80 70 60 or anonymously to Crimestoppers on 0800 555 111.